Southern Pacific class GS-4 Daylight steam engine, one of the more known classes of steam engines used in the USA. 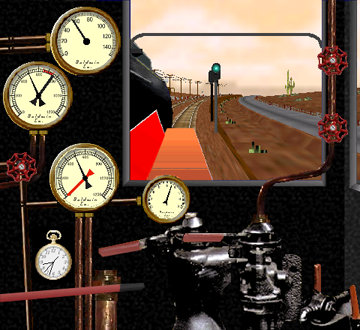 The train simulated consists of 1 engine and 4 cars. Realistic driver's stand with speedometer (mph), manometers (pressure gauges) and clock. This train was distributed at the website Train Sim Central. That website has disappeared from the Internet long, long ago.